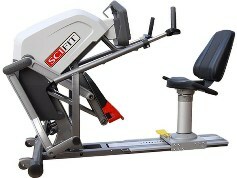 The SciFit StepOne Recumbent Stepper is the newest addition to the SciFit product line. The StepOne brings a fresh new look with the SciFit brand quality. It features a smooth, user-defined stride length, direct wheelchair access, and adjustable arm length and handle angle for comfort and fit. Allows you to get a great cardio and strength workout in one machine.